Add up all the time you spend in the bathroom each day and you might be surprised. Then do the math and it turns out that the time that the average person spends in their bathroom each year adds up to well over a week in most cases. Given that so much time is spent in this one small room, it only stands to reason you should do all you can to make that time as enjoyable as possible. 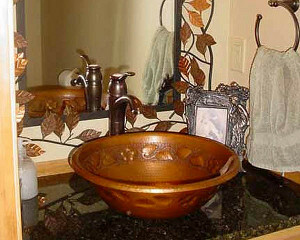 The good news here is that there’s just so many products readily available on the market that you can use to make your bathroom all that it should be when your remodel project is complete. Some are common sense and you probably already know about them. Then some of the more clever ones are newer features that you may want to hear about before you get started. 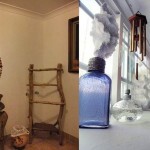 Affordable artwork for your home has been available for some time now thanks to the opening up of the global market. Skilled artisans in far-flung regions of the globe like Spain, Mexico, and Japan are now producing amazing works for Western homes that you don’t have to break your budget to acquire. 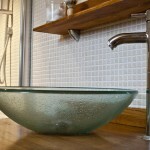 So now custom handcrafted tile murals are making their debut on bathroom and kitchen walls across the US and Canada. These aren’t assembly-line tile murals either. Rather, these are genuine works of ceramic art that are produced by individual artists from start to finish that come ready to go right out of the box. 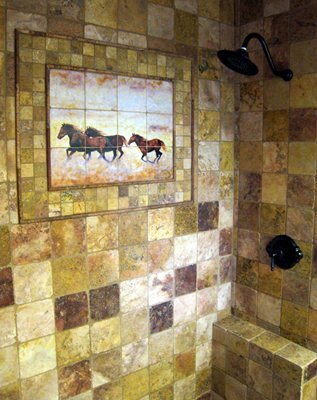 In fact, there are even online venues now where you can have your own designs reproduced in a ceramic mural, just as you have it drawn, and then shipped directly for your project. Water proof shower sound systems have been around for some time now, so this is really nothing new. What is new, however, is how low prices have come in recent years and how many features they now contain. These are state-of-the-art sound systems that you can buy and hang over the shower spigot or faucet, so there’s no installation required. 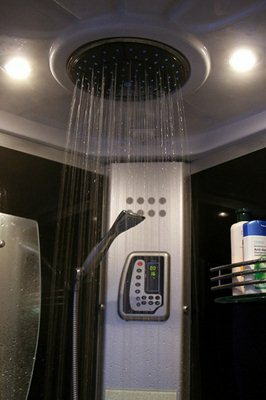 If you want to go a few steps further than that, there are also more elaborate systems that include multiple waterproof high fidelity speakers that are designed to be mounted directly into the shower wall. Don’t worry either, because they’re fully waterproof and come guaranteed to stand the test of time, so you get your money back if they end up leaking. One of the more clever innovations to make its debut on interior design show room floors are flatscreen TVs that pull double duty as a bathroom mirror. 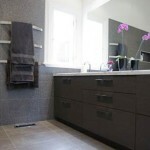 When they’re in the ‘off’ mode they look and function just like any other bathroom mirror. Then when you click them on with their handy remote they instantly become a full-featured flatscreen television. These TVs are manufactured specifically for the wet environment of a bathroom, so the water has no effect on them whatsoever. They’re also loaded with common sense, user friendly features like the option of performing both functions at one time. So you can actually watch TV with them while you’re also using the mirror! Jacuzzi bathtubs have been around for decades now but along the way they garnered a well-earned reputation for being expensive and problematic. They were great when all the components worked as they should, but for the price they cost all too often that just wasn’t long enough. 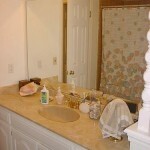 That all has changed though, and this is why installing a Jacuzzi tub is #4 on this list. 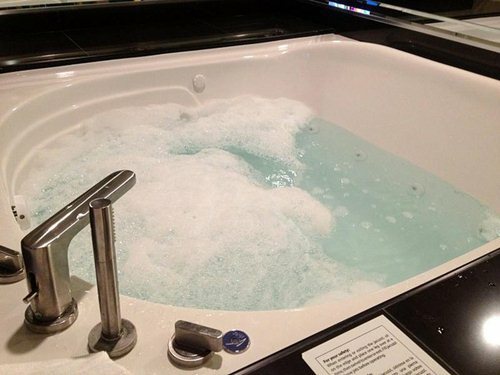 Now they’re more affordable, better made and, just as important, they’re also easier to service, because even the best made Jacuzzi tub has components that eventually wear out. They’re also easier to install too, so they fit right in just like a normal tub, so you can even do the installation work yourself if you’re up to it. 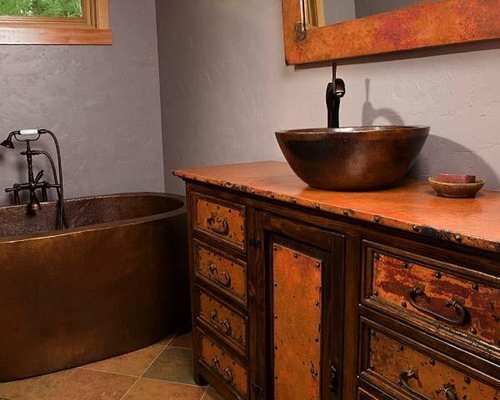 A handcrafted copper sink will bring the element of timeless beauty to your new bathroom. These amazing works of functional art are produced from start to finish by indigenous peoples of southern Mexico using the very same handcrafted tools that their ancestors used to form copper into bowls plates and works of art for generations past. 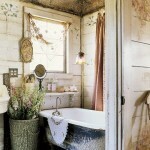 Keep in mind here that with trends in bathroom design coming and going with each passing decade, something like this will never go out of style. They’re surprisingly affordable too, just as easy to install as any other bathroom sink that you can buy at your local warehouse hardware store and then they never chip or crack, so they last pretty much forever. 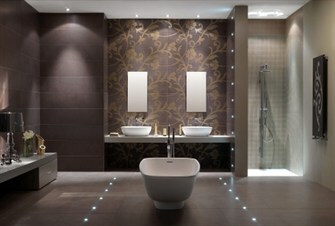 You don’t need to start in with a bathroom remodel job to install LED string lighting underneath your cabinets or around your mirror. This is because not only are LED string lights more affordable than they have ever been but they’re also so easy to put in place because it requires no wiring. They just plug right into a standard wall outlet. LED light defuses more evenly than standard lighting, so it’s softer and easier on the eye without the glare of standard lighting. Then, because it uses longer-lasting crystals instead of light bulbs, you no longer have to worry about replacing burned-out bulbs. It’s also safer for bathrooms too because at only 12 volts, it’s very low-voltage. 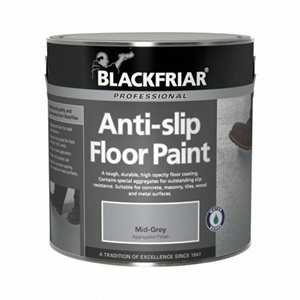 Finally, you don’t have to look too deep to see the benefit of new high-tech anti-slip tile coating. It’s a little known fact that the the one room that you are most likely to be injured in is the bathroom and the injury is most likely to result from a slip. So while this isn’t something that you’ll appreciate by looking at, you’ll for sure appreciate it when you’re walking on a wet floor. It goes right on directly out of the container just like paint, and is perfectly clear, so it doesn’t affect the look of a tile floor in any way. It doesn’t chip, cloud up or flake over time and has long service life too. So one application can last for years. It’s simply a matter of painting it on and then forgetting about it, other than when you realize the fact that your bathroom floor is no longer slippery when wet. If you take a moment to go over the above listed ideas, one thing you’ll find most of them having in common is that they’re readily available and easy to install. So you really don’t need to wait for the job to start in to get going with your upgrades. Also, don’t forget that when it comes time to sell your home, your bathroom and your kitchen are the two best rooms to invest your money in if you’re looking to make your home more attractive to buyers and get maximum return on your home improvement investment dollars.